The subject of this book is the control of software engineering. The rapidly increasing demand for software is accompanied by a growth in the number of products on the market, as well as their size and complexity. Our ability to control software engineering is hardly keeping pace with this growth. 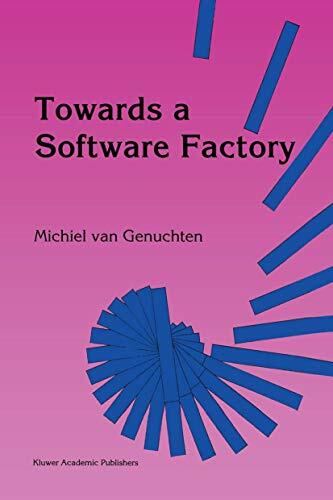 As a result, software projects are often late, software products sometimes lack the required quality and the productivity improvements achieved by software engineering are insufficient to keep up with the demand This book describes ways to improve software engineering control. It argues that this should be expanded to include control of the development, maintenance and reuse of software, thus making it possible to apply many of the ideas and concepts that originate in production control and quality control. The book is based on research and experience accumulated over a number of years. During this period I had two employers: Eindhoven University of Technology and Philips Electronics. Research is not a one-man activity and I would like to thank the following persons for their contributions to the successful completion of this project. First and foremost my Ph. D. advisers Theo Bemelmans, Hans van Vliet and Fred Heemstra whose insights and experience proved invaluable at every stage. Many thanks are also due to Rob Kusters and Fred Heemstra for their patience in listening to my sometimes wild ideas and for being such excellent colleagues.